The building is half a block south of the Chicago River, two blocks north of Millennium Park and just a few blocks from the newly opened Modern Wing of The Art Institute of Chicago. With upscale retail stores, specialty shops, numerous eateries and museums within walking distance from the hotel, the Comfort Suites is located in the heart of it all. 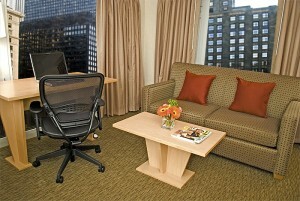 Living room features sofa sleeper, flat panel LCD television with DirecTV, and executive desk with ergonomic chair. 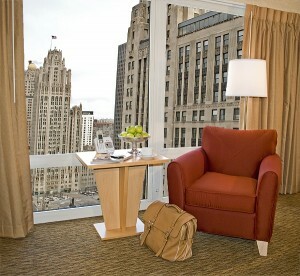 Limited Michigan Avenue view. Full kitchen featuring breakfast bar, stove, fridge, microwave and dishwasher including all pots and pans and cooking/dining utensils. Hall bath featuring marble basin and under counter storage along with curved shower rod. In-unit stackable washer/dryer. 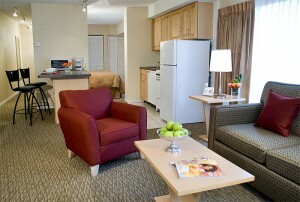 Open Queen bedroom with one Queen pillow-top bed, flat panel LCD television, laptop safe and MP3 docking station. 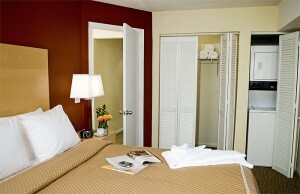 Master bedroom featuring one King pillow-top bed, MP3 docking station, flat panel LCD television, and master bath.